University of Georgia’s next generation Atrium UGACard solution includes twenty (20) new Iris scanners for their dining venues. While the Iris scanners were provided by an Atrium Partner, an Atrium App runs on Raspberry Pi’s and authenticates card holders using a light pole and turnstile to admit or deny entry. 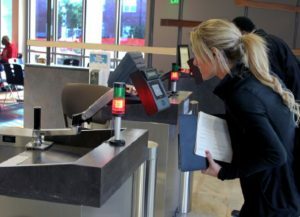 Other institutions have deployed Iris scanners, but they have typically been connected to Point of Sale systems, where transaction response times range from 2-4 seconds. UGA felt this transaction response time was too slow and would lead to long lines, given their large size. Atrium came up with an innovative, low cost solution which boasts transactional responsive times of less than a second. In addition to being very fast, the Atrium App supports offline operation. This solution has both improved dining operations and the student experience.